Although Yuzawa town is only around 77 minutes by bullet train from Tokyo, it feels like another country. Situated 200km away from the hustle and bustle of the metropolis of Tokyo, Yuzawa is nestled in the Japan alps, and offers clean air, beautiful mountainous surroundings, hot springs and is also overflowing with sake! In winter, Yuzawa is a ski and snowboard paradise. The town is famous throughout Japan as the setting for 16 ski fields. There is also a huge variety of hotels, from homely Japanese inns to four star western hotels, Yuzawa has something to suit every taste and budget. A diverse range of restaurants, karaoke, museums, international bars and traditional Japanese festivals all combine to bring any visitor a unique Japan experience. 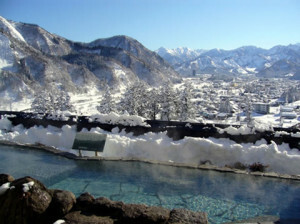 Yuzawa has a great range of amazing hot springs, from quaint historic bath houses to large modern day facilities. There is even a hot spring at the bullet train station. One of the baths is of pure sake! Yuzawa is located in Niigata Prefecture, Japan’s most famous sake producing area. One of the best ways to experience the local sake is to visit the sake tasting shop inside the bullet train station. 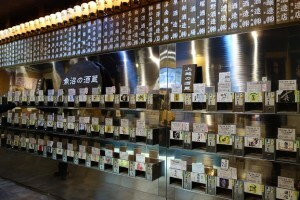 Over 100 different sake form the Niigata area can be samples for only 100 yen per drink! After your arrival, passport and customs clearance, head downstairs to the basement level JR stations, located in both terminals of the airport. The most convenient train is the Narita Express (N’EX), which leaves roughly every half hour for a 53-minute trip to Tokyo Station. Tickets for the entire trip up to Echigo Yuzawa Station can be purchased here; JR East Passes and Japan Rail Passes can also be exchanged at the JR East Travel Service Centers (see below). At Tokyo Station, head upstairs for the Joetsu Shinkansen (the station is always busy, but all lines are well marked—just follow the signs). Joetsu Shinkansen trains depart from platforms 20 through 23; most trains stop at Echigo Yuzawa Station, so you have many choices.